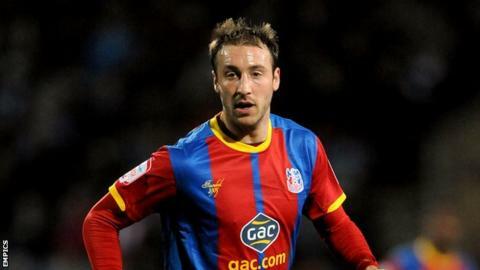 Crystal Palace striker Glenn Murray says his goalscoring return has been made possible by the service he is getting from his team-mates. The 29-year-old has scored 28 goals in 31 appearances this season. He told BBC London 94.9: "I've never had a season like this and I don't think many strikers do. "A lot of it is down to the rest of the team. It makes my job easy when there are that many crosses and that much quality around me." He added: "I've scored numerous tap-ins but that ball has got to get over there. "All I've got to do is concentrate on losing my man and if they can find me my job is pretty simple. "They are all sorts of goals but that is what the guys are putting in the box. "I have just got to get on the end of them." The former Brighton & Hove Albion striker's haul this season is the most he has scored in a single campaign. His previous best came when he netted 22 in 50 games in 2010-11 when the Seagulls, Palace's great rivals, won the League One title. "You just take every game as it comes as you never know when the goals might stop," he said. "Luckily I haven't been injured much [this season]. "I was injured at the start of the season but apart from that I was rested for the FA Cup and was banned at Hull. "I've had a good run in the team." Palace manager Ian Holloway praised Murray following their 2-1 win over Bristol City on Tuesday. "He is a phenomenal player," Holloway said. "I never realised how good he was until I worked with him every day. "The wide boys benefit from his presence and the challenges he puts in. "I need to get them moving around him a little bit more and free him up a little bit more because he brings people into the game so well. "I have got a list of good players. Believe it or not, Aaron Wilbraham is playing out of his skin in training but can't get a game because Murray is playing so well. "It is all about the intensity of the group."